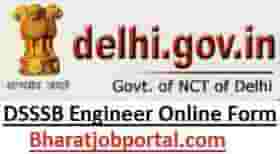 Delhi Subordinate Services Selection Board (DSSSB) has invited the online application for the posts of Junior Engineer and Assistant Engineer. Those candidate who are interested must read official notification and apply online. DSSSB Junior & Assistant Engineer Recruitment 2019. Assistant Eng (Electrical) MCD Degree in Electrical Engineering with 2 Years Exp. Assistant Eng (Civil) MCD Degree in Civil Engineering with 2 Years Exp. Junior Eng (Civil) MCD Degree/ Diploma in Civil Engineering with 2 Years Exp. Junior Eng (Electrical) MCD Degree/ Diploma in Electrical Engineering with 2 Years Exp. Junior Eng (Civil) DUSIB Graduate/ Diploma in Civil Engineering with 2 Years Exp.